Kandy, rich in tradition and history, is an ideal destination for the cultural tourist. Kandy, Sri Lanka -- It is a three-hour drive from the Sri Lankan capital of Colombo to the World Heritage City of Kandy. The journey through the Colombo-Kandy road flanked by verdant green, zipping past Maruti 800s, Altos, Lanka Ashok Leyland and Tata buses, it almost f eels like a drive through Kerala. It is the ample presence of foreign cars — the Toyota Hi Ace and Lite Ace vans — that makes it different. 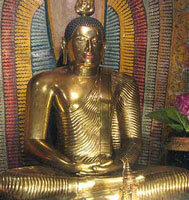 << Golden Buddha at the Temple of the Tooth. A unique, natural stone arch greets the first-timer to Kanda Uda Rata — the land of the mountains — as Senkadagalapura or Kandy is known. Sameeha Jalaludeen, who works as a psychologist at the Asiri Surgical Hospital in Colombo, travels along with me. She narrates with aplomb the history of Sri Lanka as she points out the landmarks, the different shops selling unique ceramic and terracotta items, cane bags, the red, hairy rambutan and durian fruit vendors. She said she owes her knowledge to having to study it as a compulsory subject in Government school. Statues of Buddha, seated in the lotus pose in meditation, greet one around many a corner and the lofty white Bhairava Kanda Buddha on the mountain top — bright with illumination — welcomes visitors to Kandy. The people of Kandy believe that it is the presence of the Buddha that has protected the city from the kind of destruction that happened elsewhere during the troubled times in Sri Lanka. There are many early birds who walk around the large artificial lake encircled by a white parapet wall cut in a geometric design. The Kiri Muhuda, or the Milky Sea as it is called, is home to many water birds, ducks and egrets, big water monitor lizards that show up above the surface and sun themselves on a branch of the tree abutting the lake and pink lilies that bloom in a quiet corner. As the schools close for the monthly Poya Day, the girls are dressed in a special uniform resembling the Sri Lankan sari and the boys wear a stitched white “dhoti”. They are getting ready for their fes tival dance with long sticks wound with colour paper into floral bunches. Though the presence of the Army and Police is focussed around the sensitive areas, anyone moving around in public is expected to carry their National Identity Card and foreign nationals their passports. The Dalada Maligawa, Kandy’s historic Temple of the Tooth, attracts quite a lot of foreigners. The entry to the spacious multi-tier temple is through check posts where the visitors have to show their passports and ID cards and go through a physical security check. Cameras are allowed but posing for pictures with the backdrop of the temple or the idols is not. There are plenty of places for the itinerant sight-seer in Kandy — the Pinnewala Elephant Orphanage, the Victoria Golf Course and the Victoria Dam, the verdant Peradeniya University, the Peradeniya Botanical Garden near the University. Travelling to the hill station Nuwara Eliya, Sri Pada or Adam’s Peak, which is a holy mountain for people of all faiths, and Kataragama Muruga temple – is a walk, drive or a bus journey away. In this world heritage city, preservation of the facade of buildings is taken seriously. Every Department of the Government reports to the Heritage Committee and heritage buildings are given the Government emblem. This allows them to make alterations only inside and not on the frontage of the buildings. The entry fee for the Peradiniya Botanical Garden is Rs. 30 (Sri Lankan) for the nationals and Rs. 600 for foreigners. The space has a variety of tree, plant, flower and grass species – all aesthetically arranged. It takes over half a day of walking if one wants to see the whole garden. The Mahaweli Ganga (the Sinhala name for a river is Ganga!) flows quietly through, deep beneath thick plantations of bamboo trees. The view around Kandy from near the lake is of mountains dotted with houses, hotels and other buildings. One gets to see the whole city from the viewpoint atop the hill over the lake or through the eyes of the Bhairava Kanda Buddha.